How Long Does It Take For Barclaycard Arrival Plus Card’s 40,000 Bonus To Post To Your Account? Lately I have been receiving a frequent emails from readers wanting to know how they can earn enough miles for a trip that’s only a few months away. Since many cards take an entire billing cycle after reaching the spending requirement for the bonus to post, those cards often aren’t useful for last minute trips. This is even more true if your wanting to book an award ticket with the bonus miles because award seat availability can be very limited the closer to travel date. The Barclaycard Arrival Plus™ World Elite MasterCard® is is one of the best cards to earn a bonus on for last minute travel. The bonus posts very quickly and you can use the 40,000 miles to purchases any flight or travel, so you don’t have to worry about blackout dates. Generally most cards will tell you within the terms how long it will take for the the bonus points to deposit to your account after hitting the spending requirement. For instance, the Chase Sapphire Preferred card says it takes 6 to 8 weeks for bonus points to post to your account and the Starwood Preferred Guest Credit Card says it takes 8-12 weeks! I’ve never actually had a bonus take that long to post, but I guess it’s possible if it’s in the terms. For most cards the common timeframe for the bonus to post is within one billing cycle after hitting the minimum spend. Either way, this suggests that you should plan and apply for a card at least 2 months away to earn airline miles bonus for upcoming travel. It’s not always the case that it takes as long as it states in the terms, but I wouldn’t count 100% on the bonuses posting after the close of the first statement either. The terms don’t offer a timeline of when the bonus miles post! But from my experience and reports from readers the 40,000 miles bonus posts immediately after hitting the spending requirement. For instance, I applied for the Barclays Arrival card in December and hit the minimum spend 7 days after getting the card. The 40,000 miles posted to my account the day I hit the minimum spend. This means that it’s possible for the bonus to post to your account within days of receiving the card in the mail and makes the Barclays Arrival card one of the best cards for last minute reward travel. I made a $10 test transaction on Amazon Payments when I received the card. The 40,000 miles posted to my account 7 days after getting the card. That was fast! 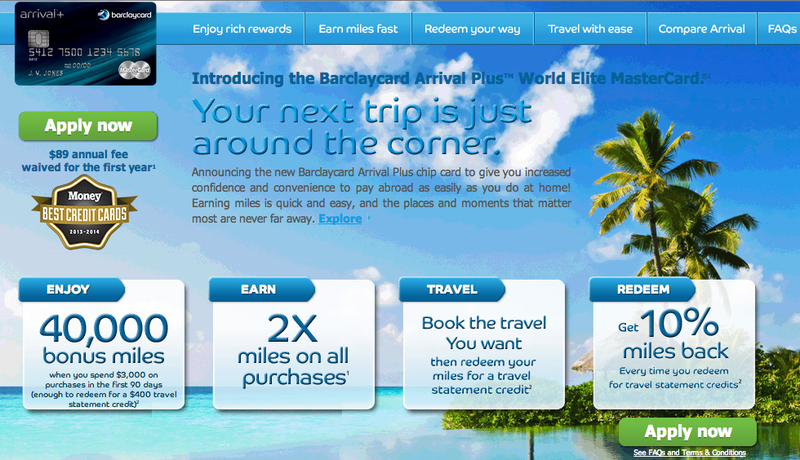 For last minute travel the Barclaycard Arrival Plus™ World Elite MasterCard® is one of the best card bonuses. On top of the bonus posting the same day you hit the spending requirements, the 40,000 Arrival miles can be used for $440 worth of ANY kind of travel. 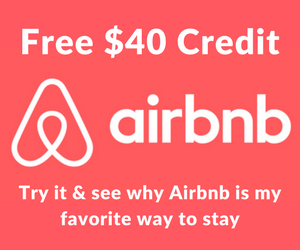 You can buy a flight or pay for your hotel stay during your trip and redeem the miles for a statement credit after you return home. This takes a great deal of planning out the equation when comparing the uses of traditional airline miles for flights. Don’t get me wrong, I love using airline miles for long international flights, but they certainly take more planning in terms of earning and redeeming. On top of that, the card earns 2.2% back on all purchases which makes it one of the highest earning travel rewards cards on the market. One of my strategies this year is to build up a balance of Arrival miles to fall back on when I can’t use traditional airline miles and hotel points to cover my travel. By spending an extra $10,000 on the card you will have $660 worth of free travel in your account for whatever kind of travel—whenever you need it. 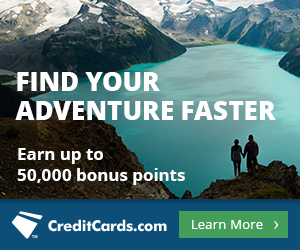 The bottom line is that most credit card bonuses can take up to 6 to 12 weeks to get deposited to your account, but the Barclaycard Arrival Plus™ World Elite MasterCard®’s 40,000 mile bonus posts immediately after reaching the $3,000 spending requirement. For last minute travel you may not be able to earn airline miles and book an award ticket in time, but you can still earn $440 worth of travel from the Barclays Arrival card to cover a portion of the trip. 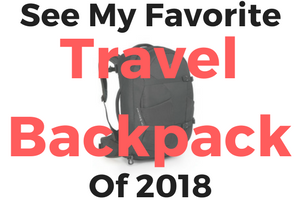 This makes it one of the best card options for last minute travel or people that don’t want to worry about planning for trips months in advance. 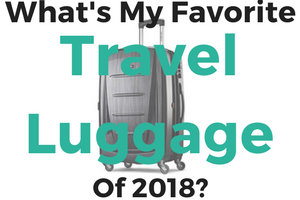 In either case, it’s a great card to have as a backup plan for unplanned travel when your airline miles or hotel points can’t cover your trip. After you have the 40k points in your Arrival rewards account you can redeem them for any travel purchase made on your card. You can also redeem for a portion of a travel expense. For instance, you can pay for a $300 flight and $200 hotel with your Arrival card and redeem 40k points for a $400 statement credit—leaving only $100 of these purchases left on your statement. Can the 40,000 points be used for things other than travel? Like cash back or buying giftcards? The best use of Arrival miles is for travel since you get a much higher value per mile. You only receive 0.5 cents per point when using the miles for cash back or gift cards, as opposed to getting 1.11 cents back when redeeming Arrival miles for travel. My husband and I each signed up for the card and got the bonus right away after initial spend. We plan on using the miles for our 3 week trip to Asia, all paid for in points, coming up in 2 weeks. We will be staying a week each in JW Marriott’s in 3 different cities. We plan on using the $1400USD that we have accrued with these BAC cards on meals at the Marriott restaurants in the 3 hotels. We are Marriott Platinum so also have use of the lounges. Question: Can we also dine at other HOTEL restaurants, outside the Marriott chain, using this card, that we will not be staying in? We would like to have a little variety. That sounds like a great trip—3 weeks in JW Marriott! I’m definitely not an expert on knowing how card transactions are coded, but you should be fine to dine at other hotel restaurants, as major hotels should code as travel. With that said there is no easy way to find out beforehand or a 100% guarantee that it will code as travel. If you’re staying a whole week you could make a test transaction the first day and see what the the purchase is coded as when it posts to your account. Happy travels!